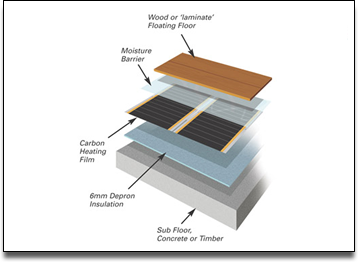 GeReLeC offers a professional service in under laminate flooring heating and insulation for your home or office. With our Under Laminate Heating System the heat rises gently throughout the room, delivering the heat directly to the living area with minimum heat loss. 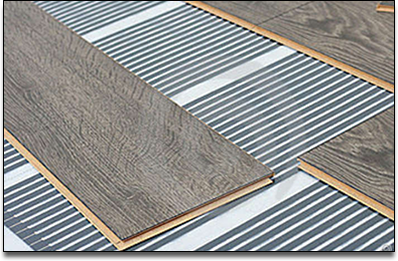 As Underfloor Heating Specialists we supply and install the full under laminate flooring heating system for your home or office. Under Laminate Flooring Heating can be quickly installed under new or existing laminate flooring. LAMINATE TYPES SUITABLE FOR UNDER LAMINATE HEATING: Under most modern laminate locking systems. Minimum specifications: HDF-core (High-density fibre) laminate flooring that has a density of at least 850kg/m3, is between 7 and 12mm thick, has a join strength of at least 600kg per linear meter and a locking system that can be refitted several times if necessary. ECONOMICAL: Our under laminate heating system is effective within 30 minutes of switch-on. You can heat the area that you need, when you need it. To give you an idea of the economy of our underfloor heating system, a ULS300 (140 x 200cm) underlaminate heater uses less power than three 100 watt light bulbs. 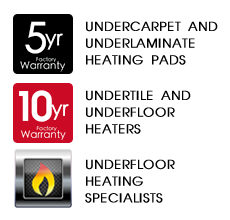 SAFE: Our under laminate heaters are safety tested and are completely waterproof. It is encased in a tough "earth shield" which withstands heavy traffic and eliminates the risk of electric shock. UNOBSTRUSIVE: Discreetly hidden from view, this wafer-thin heater lies hidden between the laminate and underlay. There are no visible elements or radiators. No summertime storage problems.